HOW TO LIVE A BALANCED LIFE EVEN WHEN YOU’RE TOO BUSY – THE METHOD THAT WILL CHANGE YOUR LIFE! Living a balanced life in todays fast paced world can be so hard to achieve – it feels impossible, doesn’t it? I’m sure you try each and every day to do a bit of everything you feel you should be doing – but life gets in the way. We try our best, but all those day to day tasks can take over all too easily and we get bogged down in the small stuff rather than looking at the bigger picture. Let me ask you a question – at the end of everyday, can you truly say that you have a balanced life – or are you just keeping your head above water? This post will change the way you look at your life, and take you step by step through the 5 areas that create more balance. Are you ready? I was only a teenager when I came up within this acronym, but it’s stayed with me every day since – that’s how powerful it is, and I want to share it with you today. Isn’t it strange how some things just follow you through your life, no matter what other things change?! I was (still am) always thinking about things, how to be happier, how to get where I wanted to go in life, how to get everything done without losing my mind, how to get fit when I couldn’t run more than 100 metres without stopping for breath etc…. and my mind is still switched on permanently (if anyone out there has the OFF switch, can you lend it to me!). It was in one of my sleepless nights that I started to think that it must all be easier really – why make things hard for myself – just a few focused thoughts on the day would make me appreciate what I had achieved, focus me for the following day, and sort of say goodnight to the day. It subconsciously makes me ready to start the next day afresh, and ready to make it count. … and it’s worked for me every day since…. I wanted to have something that would be easy to remember, and that went through all the parts of my life that were important – and that’s when it hit me! When life is going well, when you’re happy – you smile. So – to judge whether I was happy in my life, – I created the acronym “S.M.I.L.E”. It really helps to balance my life and the results were a happier, smiling self! – perfect! WHAT DOES S.M.I.L.E STAND FOR? The idea is – if you can do AT LEAST ONE THING from each area of S.M.I.L.E each and every day, then you will have lived a balanced life overall. You won’t be able to neglect anything for long, as you will be constantly reminded of that fact. So – no more skipping breakfast because you haven’t time, or missing the gym because work got in the way, or not seeing friends for months because you’ve not booked anything in – you will start to be in control, see the bigger picture, and start creating a balanced life for yourself – easily! It truly does work for me – so my challenge for you is to try it for yourself and MAKE YOURSELF S.M.I.L.E for the next week! WHAT’S INCLUDED IN EACH PART OF S.M.I.L.E? Could be with friends, family, children or your partner. These are the things that often go unnoticed – but are vital for an easier life. They are key to keeping you and your family together – and are vitally important (why else would I have a whole website dedicated to it!). They deserve some recognition! Whether you work or not, ensuring that the house brings in some income is vital to staying happy – we all need enough to get by. DO YOU WORK FOR SOMEONE? – Obviously your wage can count for this which is an easy win! You may also be able to earn overtime, get a promotion etc… – so it will help you to focus on extra ways to improve your income. DO YOU WORK FOR YOURSELF ? – Use this as a gauge to how productive your day has been and to focus your mind on money earning tasks rather than busy tasks that don’t actually help overall. ARE YOU A STAY AT HOME MUM? – You have a vital role in your home’s income in that you can budget and make the money go further. Maybe you can save money – and that is just as much income for the house as any wage. And there’s even more! – maybe you are preparing to earn an income in a different way – so you may be going through education or building a business – this can count for longer term income plans. This is what I like to class as anything that helps EMOTIONAL HEALTH (the next letter is for PHYSICAL HEALTH!). This can be thought of as LITTLE BIT OF TIME FOR ME as well – Anything you have done to relax, recoup, or just had some “Me Time” will work well in this section. Use a posh face cream as a treat! Anything! – and it doesn’t have to take lots of time. The key here is to see that you are having a treat at least once a day – and recognising it as such. This is about your physical health, as I said before. So it’s focused on eating well (your 5 a day, drinking enough water, getting a balanced diet etc…), Keeping fit, and anything else you do to stay energised and maintain good physical health. Because you’re actively asking yourself at the end of each day to think about what you’ve eaten and what you’ve done to keep fit, you are more likely to make better choices during the day – it works! 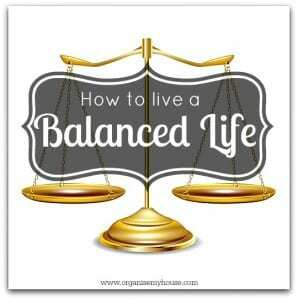 So – do you have a balanced life, or is there work to do? A quick tip that works for me is to think about this acronym each night as I go to bed. I can see exactly how much I’ve achieved even on the days that I’ve felt nothing has got done – and I usually go to sleep a lot happier as a result. Of course – you could also use a diary to see how far you are getting towards your goals etc…… i.e. if your aim is to lose weight, you may chart your progress in Leisure and Energy – or if you want to get more organised you may look at a different area in the house each week to concentrate on – WHATEVER WORKS FOR YOU! (I like the idea of tracking in a bullet journal or a planner). Fancy learning even more about this amazing way of thinking? – You’re in luck! 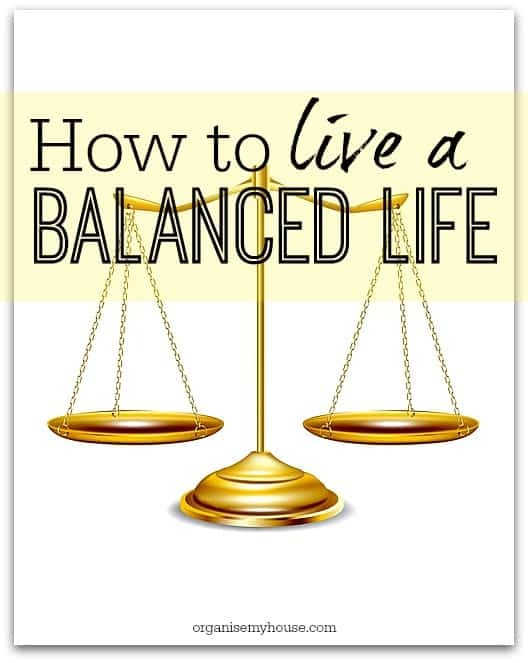 – I’ve written a much more detailed post about each of the 5 key areas of a balanced life – so click on one of the following to get started…. Hi – Really glad you use it to good effect – It helps to keep things focussed, and to ensure you are both happy with where things are and whats in the future.